HWBOT World Tour 2015 – Asia Computex | Computex Parties - The first directory to find all parties held during Taipei Computex show! 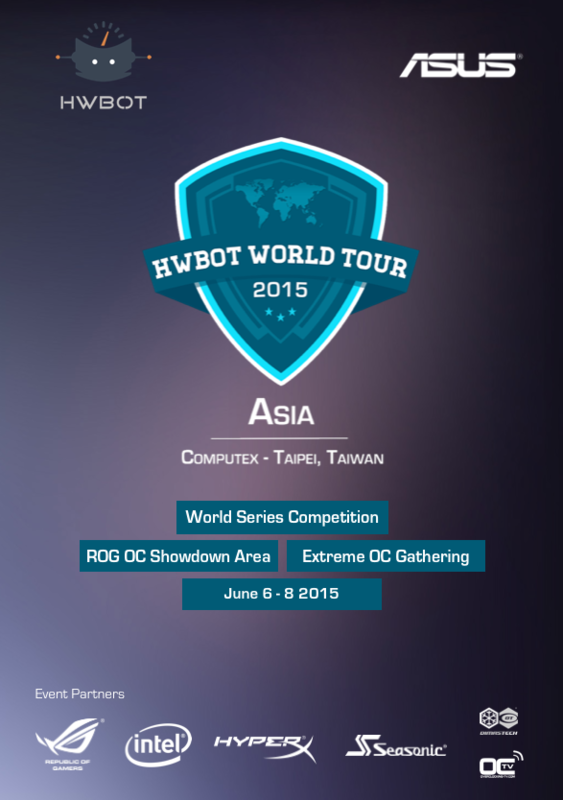 Today, we proudly announce the third stop of the HWBOT World Tour, this time in Asia! From June 6 to 8 you can join us for three days of non-stop overclocking at the MakerBar in Taipei, Taiwan on the days that follow the Computex 2015 trade show. The HWBOT World Tour Asia stop is brought to you by HWBOT and partners: ASUS ROG, HyperX, Seasonic, Intel, DimasTech and OverClocking-TV. – ASUS ROG OC Showdown Area on which you can compete for WRs, cash and fame! – BenchSpot – Individual LN2 Overclocking Pass: suitable for any extreme overclockers. For media, please contact press [at] HWBOT.org to be accredited.